COLORADO SPRINGS — Justin Rose (pictured) can't really recall the details of the July 2009 explosion in Iraq that left him with a traumatic brain injury and post-traumatic stress disorder. But he vividly remembers the effects. "I got home and hit the bottle, gained a lot of weight, started getting in arguments, started yelling," the 32-year-old Navy Corpsman from Shinnston, W.Va., says. "I didn't think anything would pull me out." 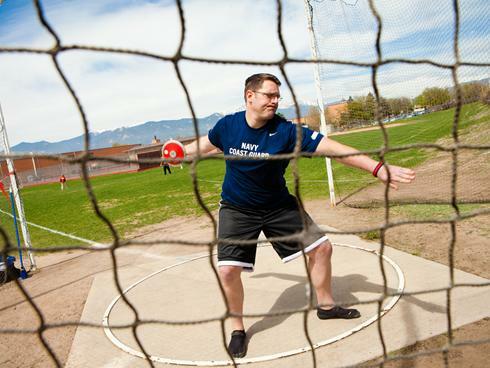 His lifeline: An Olympic-style competition for wounded, ill and injured military members called the Warrior Games. "It got me moving, it got me where I had to do something," says Rose, who is expecting the birth of his first child in July. "Without the Warrior Games, without training for the Warrior Games, I wouldn't be where I am today." Rose and 197 other men and women from all military branches competed last week in the second annual Warrior Games, held at the U.S. Olympic Training Center and other venues in Colorado Springs. The Games, with events ranging from track and field to wheelchair basketball, showcased a can-do sports culture that has taken root among combat-wounded veterans of Iraq and Afghanistan and helped many in their recovery. "We're seeing a new generation of veterans who have brought a different perspective," says Lt. Gen. Eric Schoomaker, the Army surgeon general. "These are veterans who come in, who are amputees, who want insights into how they could trim minutes off their triathlon time." The confluence of these veterans' ambitions with increased government funding, more support and expertise from organizations such as the U.S. Olympic Committee, and dramatic advances in adaptive sports equipment has made sports a more prominent part of veterans' rehabilitation than in previous wars. "We wanted to do things," says Kirk Bauer, who lost his left leg to a grenade explosion in Vietnam and now is executive director of Disabled Sports USA. "But we had absolutely no idea how to do it, and there was no equipment and no one trained to show us." As the number of combat-wounded veterans of the Iraq and Afghanistan wars has increased — to more than 43,000, according to the latest Department of Defense statistics — the new approach is most evident in an attitude shift among caregivers. "We used to try to set limits (on what they can do), because we didn't want people to get discouraged. We don't do that any more," says Col. Barbara Springer, a former chief of physical therapy service at Walter Reed Army Medical Center in Washington. Now therapists try to identify an activity of interest to each wounded war veteran early in rehabilitation, and they focus on helping them participate in that. "Once they see they can do that activity, then they have the confidence, the self-esteem, to try anything," says Springer, director of the Army's rehabilitation and reintegration division. Travis Greene spent 53 consecutive days in intensive care after an improvised explosive device (IED) in Iraq tore off both his legs above the knee in December 2005. His muscles atrophied to the point, he says, that he couldn't roll over on his own. His heart stopped beating four times. Yet, on a physical therapist's insistence, one year after his injury he took his first run on a mono-ski in Colorado. By the third day, he was skiing the most difficult terrain. "Once I figured out I was still an athlete, even after losing my legs, that's when my recovery really started," says Greene, 29, who before joining the Marines was a hurdler at Boise State. Greene competed in shot put, discus, wheelchair basketball and sitting volleyball at last week's Warrior Games. Back home in Boise, he has co-founded Idaho Warrior Sports and Recreation. "Growing up, I always wanted to be involved in sports some way as a profession," Greene says. "You just don't know what's out there until you start doing it." The most high-profile opportunity is the Paralympic Games, the top international competition for physically disabled athletes held immediately after each Olympics. "If we can get more of our young men and women that become physically disabled back into the pure process of going out and playing, or being physically active, we will also see some of them pursue the Paralympic Games," says Charlie Huebner, the USOC's chief of Paralympics. Five veterans of Iraq and Afghanistan are living at U.S. Olympic training sites, preparing for the 2012 Summer Paralympics in London. Huebner predicts 15% of the 2012 U.S. Paralympic team (about 30 athletes, up from the 16 who competed at the 2008 Summer Paralympics in Beijing) will be military veterans, though not all from the Iraq and Afghanistan wars. Manuel Jimenez, who won the 800-meter race for upper-body amputees at the Warrior Games, would like to be one of them. The 22-year-old Marine from New Britain, Conn., lost his left arm in an IED blast in Afghanistan last August. "It gives me different goals," says Jimenez, a cross country runner in high school. "Now I try to beat my times. I'm doing half-marathons with able-bodied runners. They're surprised you took your injury in such a positive way." In 2003, military officials began asking the USOC to send Paralympians to hospitals and other rehabilitation centers to meet with wounded war veterans. A year later, the USOC founded the Paralympic Military Program. The program will host 10 military sports camps this year and has established 131 Paralympic sport clubs nationwide. The Department of Veterans Affairs provides $7.5 million annually to the program; the Department of Defense contributes $5 million. "The most important thing that we and our partners do is make sure there's programming available for when young men and women return to their community or their installation, because that's where the rehab process really takes hold," Huebner says. Ashley Chavez, who was in a supply convoy headed out of Baghdad in November 2006 when the vehicle she was riding in hit an IED, is at Camp Pendleton with the Marines' Warrior Athlete Reconditioning Program, surfing and cycling and improving on the shot put and discus skills she had in high school. "This has changed my life both mentally and physically," says Chavez, 25, of Dayton, Ohio, who suffers from traumatic brain injury and post-traumatic stress disorder. "I know now that I can do anything. There may be stuff that I can't do perfectly, but it doesn't mean I can't do it." In the last two years, according to the USOC, physical activity and sports participation rates among wounded, ill and injured war veterans have risen 23%. The Warrior Games were created by representatives from the Department of Defense, United Service Organizations (USO) and Ride 2 Recovery, a California-based nonprofit that helps wounded veterans get involved in cycling. The Games are highly competitive, among the service branches as well as the athletes. But they are also a form of group therapy. Competitors and their families and friends find a comforting camaraderie. "It's been really big for him," says Rose's wife, Stephnie, "and for me too. We have family now that we didn't have before." Competitor Bill Biondolillo, who is married with three teen-aged daughters, says, "It helps your family, because they see Dad out there and your wife sees her husband happy again." Biondolillo had served 13 years in the Army before 9/11. He requested reinstatement to active duty while working at Ground Zero as a firefighter. During his second tour in Iraq, in 2004, an IED blast caused a traumatic brain injury, spinal injuries and nerve damage in his left leg. "I always ran marathons and half marathons," says Biondolillo, 43, of Hamburg, N.Y. "It was part of my being. So when I did get hurt, it was a big blow to me psychologically." It haunted him until repeated entreaties from Disabled Sports USA convinced him to try downhill skiing last December. "I didn't think I could do it," he says. "I was afraid of injuring my back. But you find out you've got to get off the couch and try it. Even if there might be some injury, you still have to live life." With the goal of becoming a biathlete, he cross-country skied more than 10 times this winter and competed in shooting at the Warrior Games. He is considering starting a nonprofit to help war veterans get adaptive sports equipment. The rapid improvements in that equipment in recent years — such as the carbon-fiber "Cheetah" limbs used by double amputee Oscar Pistorius and other runners — have been driven by the demands of the new generation of veterans and the increased availability of government research dollars, Disabled Sports USA's Bauer says. Previous wars also have brought advances in equipment and in what disabled athletes will try and do, Bauer says, but the Iraq and Afghanistan wars have "produced much greater acceleration, a greater pushing of the envelope." That was on display at the Warrior Games. But, at times, as Springer watched competitors race around the track and jockey for rebounding position on the basketball court, she flashed back to when some of them first arrived at Walter Reed. "It's almost like closure to me," she says, "because I know they're going to be OK."